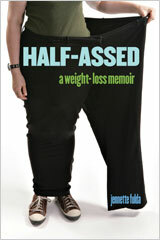 For more than six years, Jennette Fulda chronicled her journey of losing 200 pounds on PastaQueen.com. She now writes about other things at JennetteFulda.com. PastaQueen lives on as an archive, but comments have been turned off because spammers are chatty. 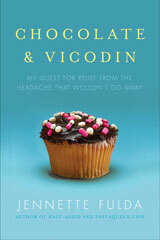 Jennette is also the author of Half-Assed: A Weight-Loss Memoir and Chocolate and Vicodin: My Quest for Relief from the Headache that Wouldn’t Go Away. She specializes in WordPress development at Makeworthy Media. I have a question about loose skin. You’re not the only one. Read my entry about the state of my skin. I want to start running. How’d you do that? The idiot’s way, but I wrote an entry about running so you don’t have to injure yourself like I did. My friend Shauna offers an excellent beginner’s running course online at Up and Running. Screw motiviation. Read about my philosophy in the entry Motivation Shmotivation. I have a question about the South Beach Diet I want to ask you. Well, I’m going to Google the answer, so it’s faster if you do that yourself. I’m not an expert on the South Beach Diet and I’m not a dietician or nutritionist, so I’m not qualified to prescribe meal plans either. There were several factors I took into account. Learn more about it here. Jennette has been featured in the following places. Visit the timeline on JennetteFulda.com for more information.